A V W representive sent an email stating it is ‘trademark infringement’ and Etsy took down the listing. Frankly I’m in no mood to protest this, as it would be more stress/hassle than what it’s worth. By the time labour, shipping and production costs are involved, we make pretty much nothing (the reason we needed 15/20 people interested at the start to cover costs), so unfortunately I don’t really have a choice I still have a few of each colour (I remade a few more before receiving this), but won’t be listing them - Sorry. Any pictures of the lacquer peel? As the title suggests really. Every time I try and get on to the forums website from a mobile (iPhone), it sends me to a spammy website which automatically takes me the app store to purchase something. By the time I'm on the app store I've already exited the app (for obvious reasons) so I'm not sure where it's trying to take me to. Anyone having a similar problem or know about this?! Desktop works fine btw. Best car on this forum, love it! There is someone one Facebook selling a set of UP! seats which they have adapted to fit into a Lupo. Looks like they've got custom brackets and bolts for it to fit. T3LLIOTT replied to Charliepops's topic in New member? 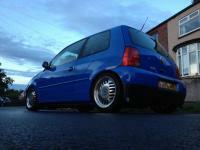 Try VW Lupo groups on Facebook. Loads of people braking Lupos on there, so getting hold of a mirror cover shouldn't be too much of a problem! Thanks mate. Glad you appreciate the detail on the Bathursts, as it took me ages to design/draw up! I wouldn’t say the silver is fresco, it’s more grey tbh. Think it’s been made darker because of the black metal playing behind it. Ill try an even lighter grey when I do more red versions if you want to wait? I'm out of red, but I'll get some new ones made up. Didn't realise that colour would be as popular as it has been! I also didn’t know this. Thanks for the info, I’ll look into this for future items. Not really. Maybe £100 tops with curb marks, bad paint and no centre caps. Okay guys and girls, I'm going to get these into production and see how they go! 😁 I'll post some pictures up and let you know how to order/pay when they're finished. It's getting there! Let's see what happens in the next week (with regards to interest/confirmed orders) and I'll make a decision.